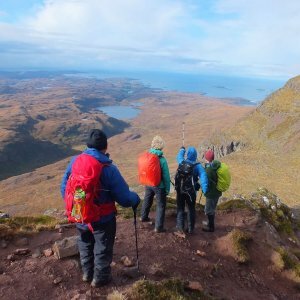 A hiking holiday in Scotland is an experience hard to beat. Empty of people maybe, but not of hillwalking interest. 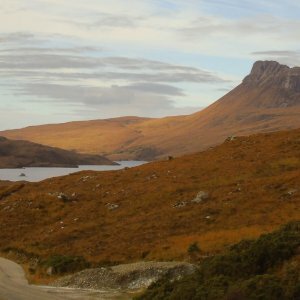 This is the very distinctive wilderness of Assynt & NW Sutherland, where the superlatives really start to flow – ‘island mountains’ rising abruptly from a vast loch-pitted tableland. The sense of space is superb. 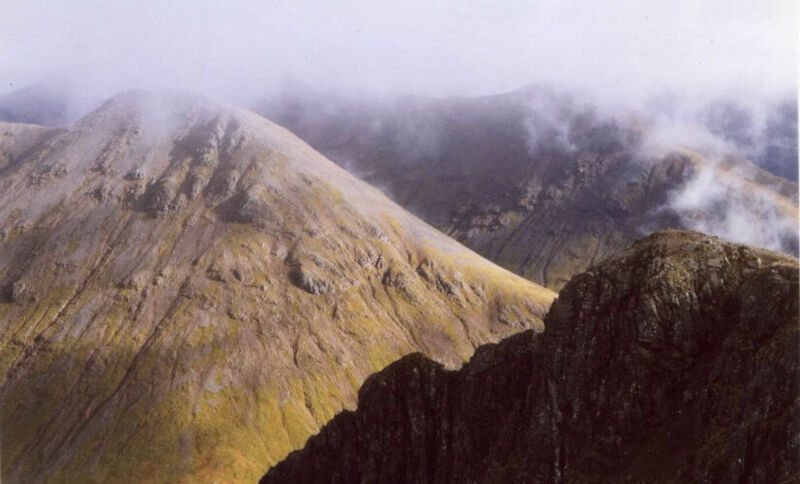 These are the most eye-catching of mountains with fantastic walking. I’d like to go hiking and see some famous sites. What tour do you suggest? 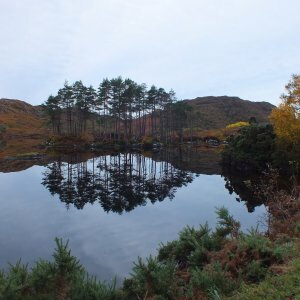 Arrive: Fraoch Lodge on day of arrival, preferably before 7pm so that you have time to settle in and meet the rest of the group before dinner. 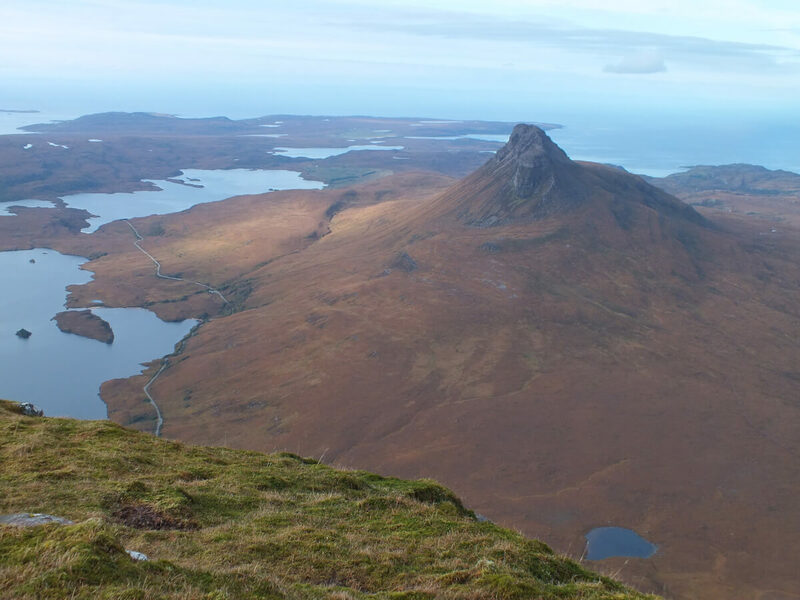 Day 1: We head Northwest for the dramatic looking peak of Quinag. 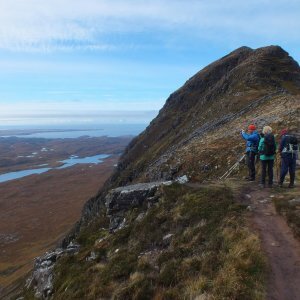 The array of rocky features belies a relatively easy but exhilarating tramp in typical Assynt splendour. We return from the mountain to our accommodation nearby. 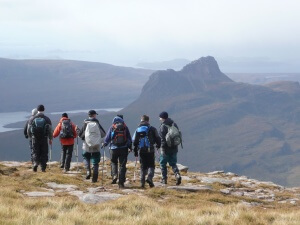 NB stats shown are for the whole horseshoe walk including all 3 Corbetts of Quinag. We may well be doing a shorter version of this route. 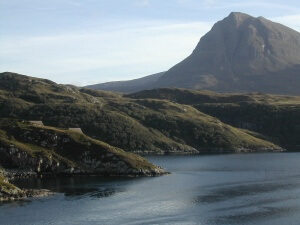 Spectacular Quinag dominates the view from Kylesku. 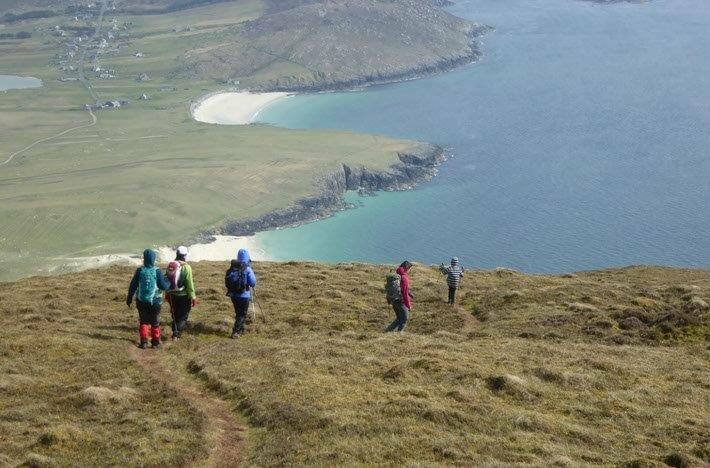 Day 2: We climb Cul Mor. Standing head and shoulders above its neighbours it’s a formidable peak. From its plinth, its craggy south, west and northern slopes sweep up at great angles to its summit plateau. Fortress like, it dominates the view across the loch strewn wilderness to the Atlantic beyond. 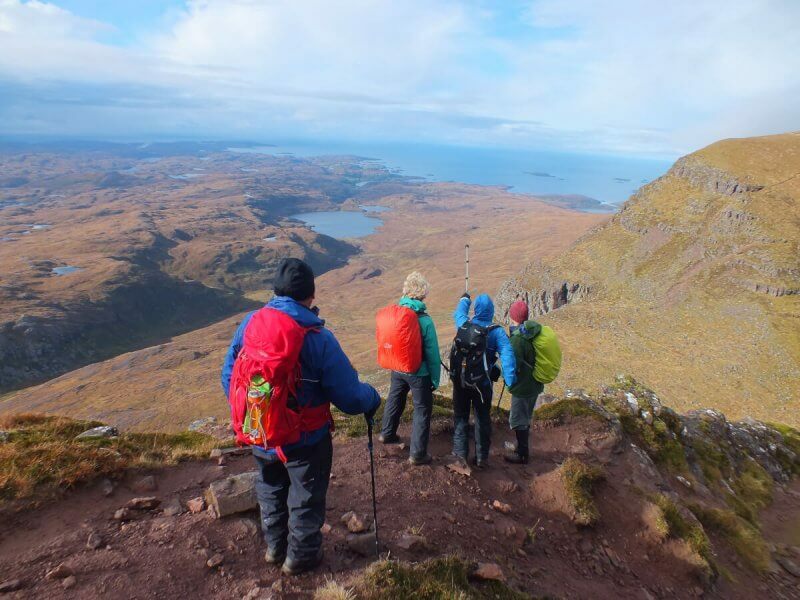 Day 3: With Ben Mor Coigach you couldn’t ask for more from a hill. 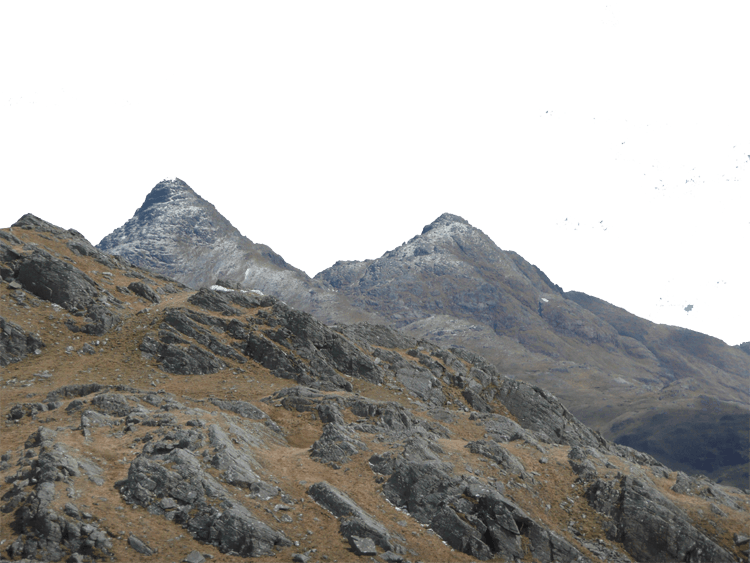 It has complex landforms, a nice ridge, and several tops. 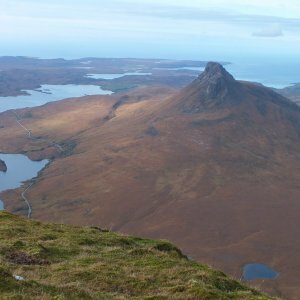 The biggest advantage of BMC is that you can see Suilven, Stac Pollaidh, Cul Mor and Beg all in one view from here, with the Summer Isles and An Teallach, Beinn Dearg and Fannichs, and Western Isles filling the remaining quarters. Day 4: From breakfast onwards this is a day off. 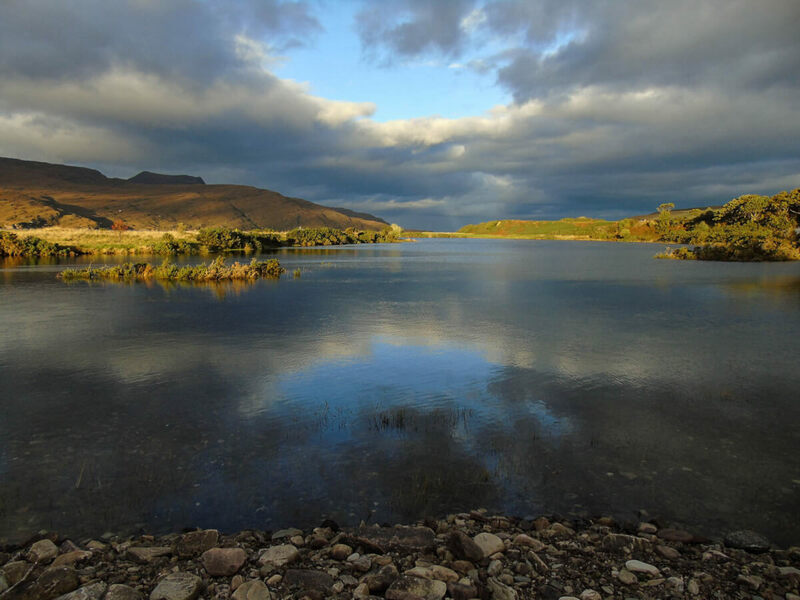 It’s a chance to explore Ullapool a little more, or go for a gentle walk along the shore. The day is rounded of with us all going out to dinner at a local restaurant. 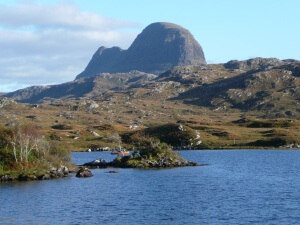 Day 5: Suilven – the area’s most depicted mountain – its western prow stands defiant ahead of this fin of a mountain. The approach is a wonderful gander leading to an enthralling ascent of this incredible peak. 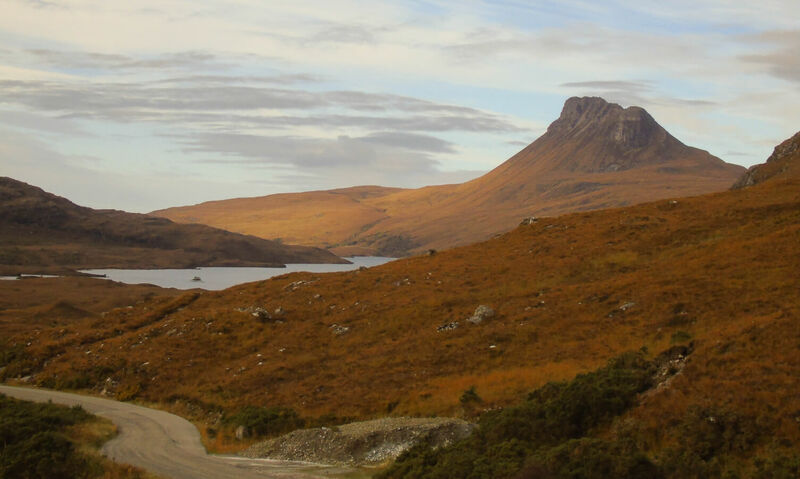 Spectacular views abound in Assynt even though the mountains are not the grandest in height. 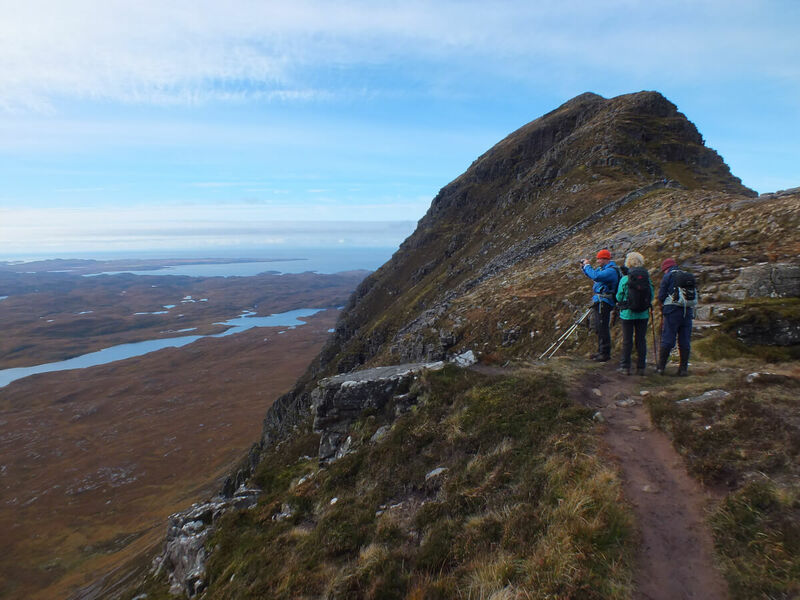 Day 6: We head up to Stac Pollaidh before heading back to Fraoch Lodge. 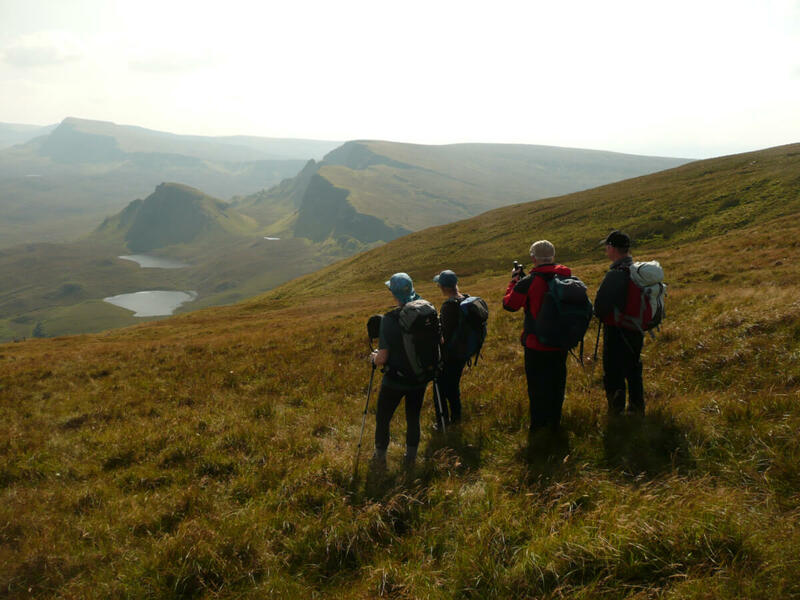 This modest but striking mountain gives a superb viewpoint to view the week’s routes. Depart: morning after walking finishes. 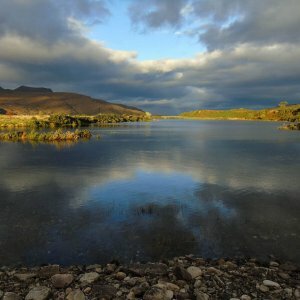 What more could you ask for from a hiking holiday in Scotland? 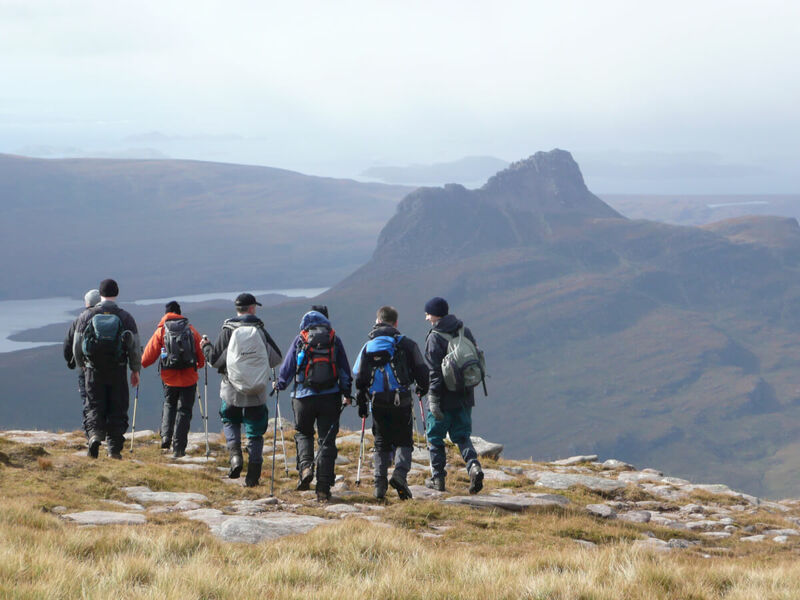 We take the whole ethos with us when we run trips away from our home base of Fraoch Lodge. 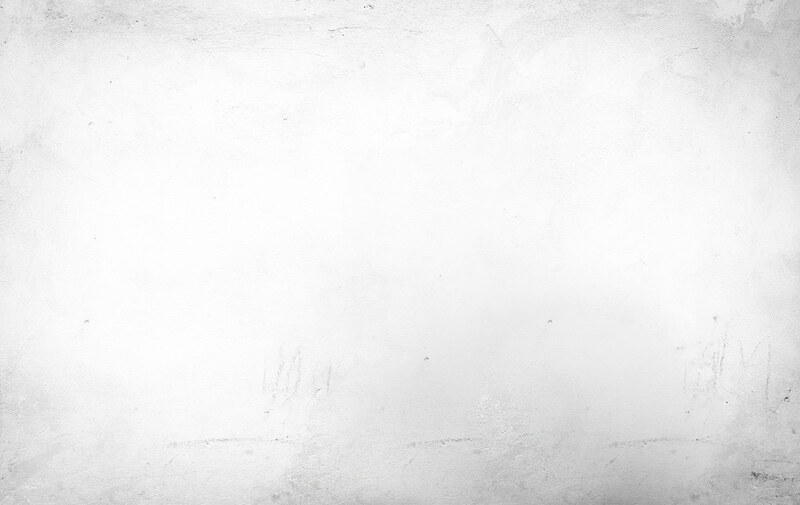 The whole family team journeys out with you and provides for you no matter where our base is. 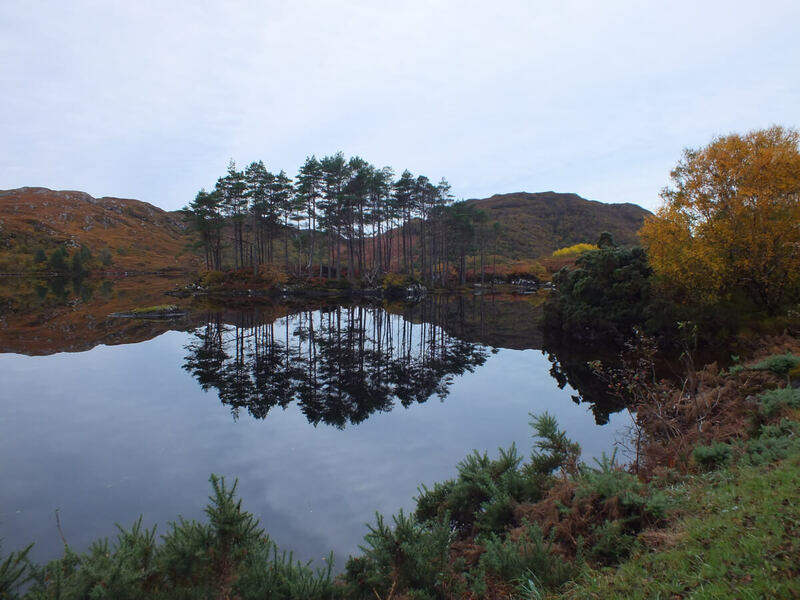 We’ll book a well-appointed cottage large enough for our group and in Ullapool, Lochinver or nearby. The cottage will have wifi but may not have a TV signal. In 2016, we are staying at Dunvegan House in Ullapool. 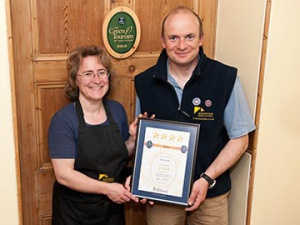 Scot Mountain Holidays will be hosting, guiding and catering with the best of Scottish produce. 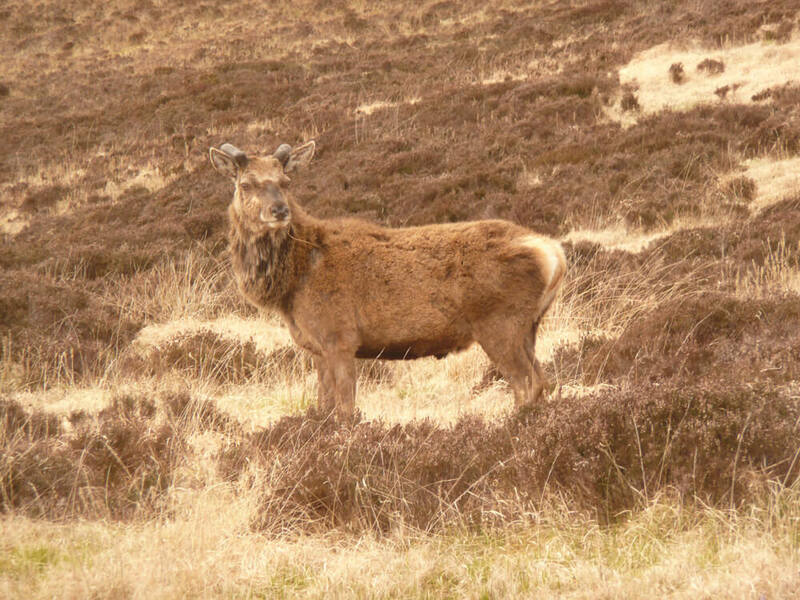 As there will be limited opportunities to restock our supplies while over in the Hebrides we will be planning the menu in advance and would ask that you make sure to give us all your requirements in advance. If there are any Scottish specialities you definitely don’t want to try, please say.